At SHOT Show, Accuracy International (AI) unveiled a new line of pistol-grip skins that will allow owners of the AE and AW rifles to match the ergonomics of the pistol grip on AI’s new AX rifles. This “skins” bolt on to the underlying AI chassis system, providing a new look from fore-arm to buttplate. We expect these new skins will be hugely popular among AI shooters, many of whom will ditch their old thumbhole skins and bolt on the new pistol grip models. Availability is unknown at this point, but pricing will be in line with AI’s other skins. 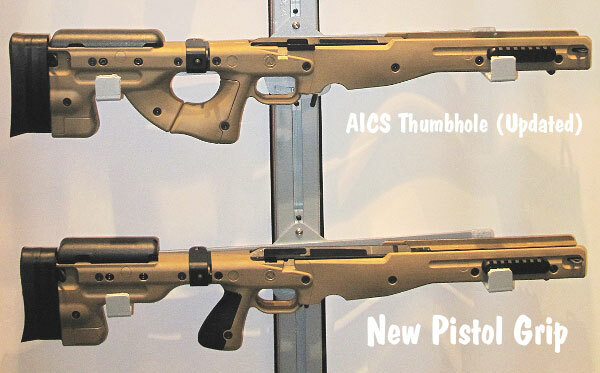 Share the post "SHOT Show: New Skin Kits for Accuracy Int’l AE and AW Rifles"
Just a quick note: the first stock on the photo is not the “old thumbhole”… it is the NEW thunbhole AICS model. Look like Viperskins from Victor Company. Didn’t take long for AIC to copy them. Wonder who will get the patent first. I believe it was Pete Lincoln, of Roedale precision, who first announced pistol grip panels for the AICS and RCS platforms. (RCS = Roedale Chassis System for Tikka and Howa) He had problems getting ahold AICS panels for his RCS chassis so he decided to manufacture his own panels. But they never reached the market. It would be nice if you guys actually knew what you were talking about. AI made a covert L96 with a pistol grip and back end remarkably similar to the AX over 25 years ago. Marty Bordson actually owns one of these rare rifles. Some have commented on how similar the Viper Skins are to the the AX profile. The AX was in design back in 2008 long before Victor company had the creativity and innovation to design it’s own (yea right) stocksides. Until you understand the facts, you would look much smarter if you just kept quiet. Fred: That’s because he was using AICS stocks and then sticking his own name on them. He had no option but to have his own made after AI stopped supplying him, but like more things Pete, words don’t stroke with reality. He has built up a reputation, no matter how good a guy he is in person. Viper skins is the first to offer a real product. But I don’t think anyone is getting a pattent for this though. So I’m afraid Victor Co lucked out on this one unless they can keep their market share. What are you talking about? I didn’t call AI, or anyone else, a rip off. I just linked to a thread, on SH, that contained the phrase “rip off”. The thread actually contains replies from AINA, Victor Company and Pete Lincoln addressing the thread starter’s accusation.